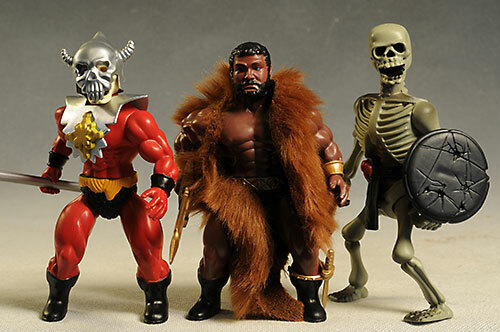 If you're a child of the 80's, with a love for the classic action figures of the period, especially the original Masters of the Universe line, then Zoloworld might have just the toys to trip your nostalgic trigger. 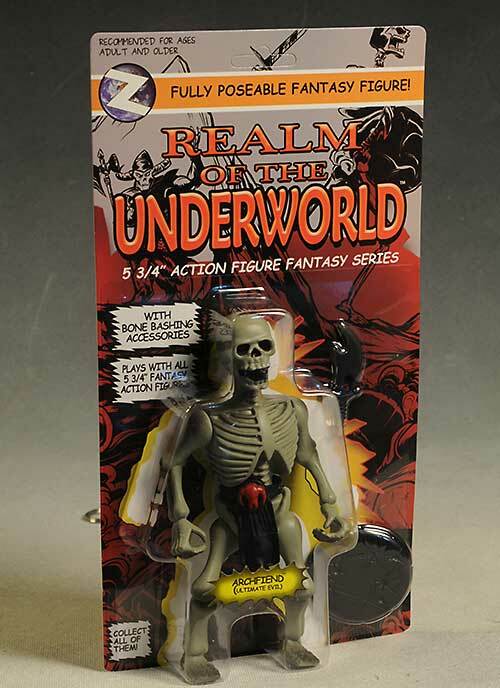 The line is called Realm of the Underworld, and this first series includes Hercules, an Acromancer (the dude in the helmet), and two different Archfiends, one with a long sword, one with a shorter knife. There's also a hidden mystery character that's not yet out, and his black outline on the package has a very Conan-like appearance. These figures run $23 each directly from Zoloworld, and are shipping right now. The materials used are also very high quality, with a sturdy bubble and card. There is one of those things that make you go hmmm...on the top it says "for ages adult and older". Hmmm. 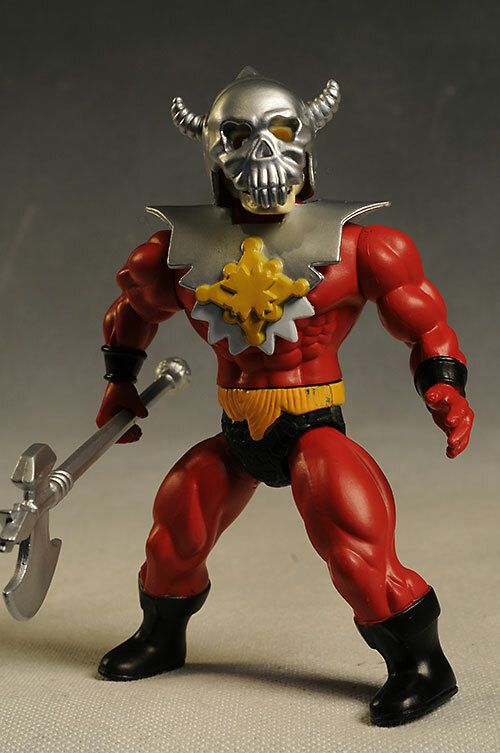 The style of these figures was chosen for very specific reasons, and fans of the old school 80's action figures (especially Masters of the Universe) are gong to appreciate the look. Others...maybe not so much. 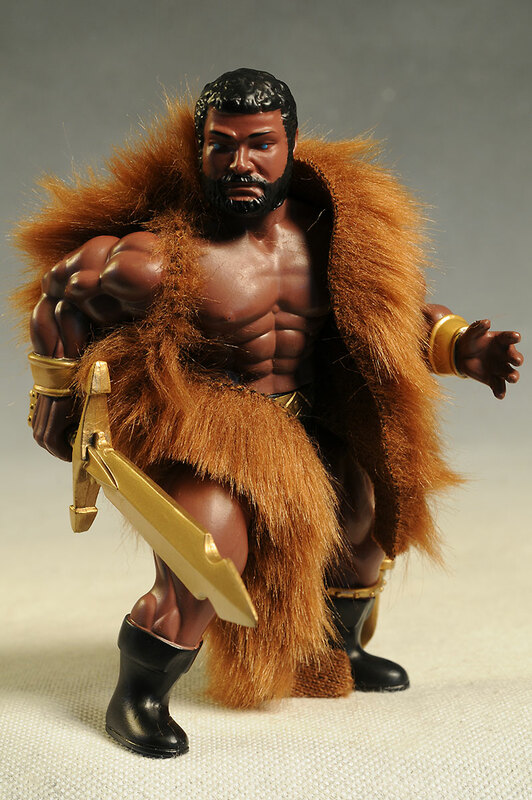 The figures are heavily muscled, with stumpy limbs and bow legs. 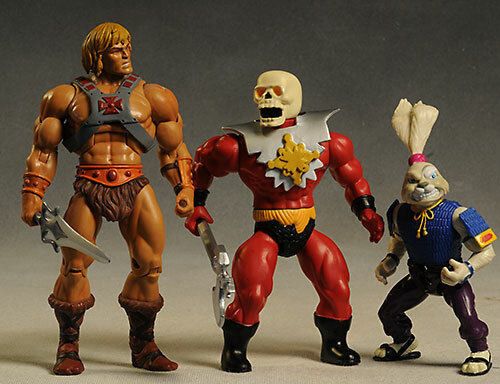 They stand just under 6" tall, which means they should fit in with the old series fairly well. The sculpting isn't particularly detailed, and some of it's just too soft for my taste. 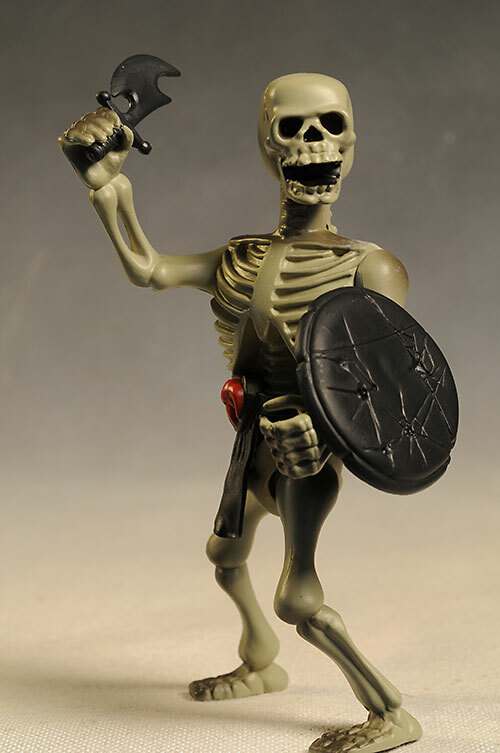 For example, the Acromancer's skull face could have been so cool, but the softness of the sculpt, especially around the teeth, and the lack of any texture really cheapens the appearance. Of the three, I like the Archfiend the best, with his skeletal look, but even he has less sharpness than he really should. 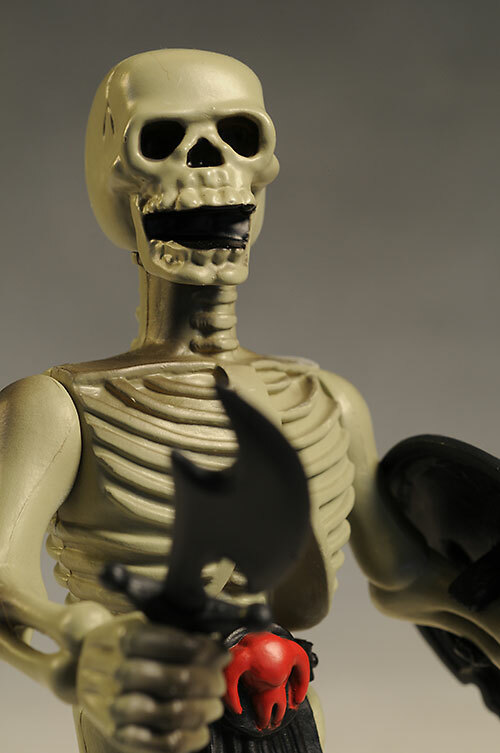 Perhaps the biggest issue for the figures in this category is the very hard plastic used for the body and limbs. 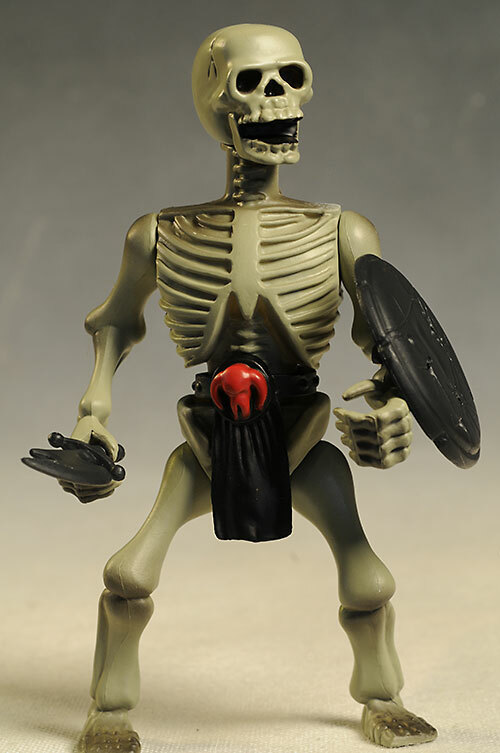 The pieces are hollow, and the hard plastic feels cheaper than the softer, solid pieces we get with lines like the new Masters of the Universe Classics. Considering the price point, that's going to hurt them. They do stand terrific on their own, even with the slightly small feet. The hands work with the accessories as well, making them useful across the board. The paint doesn't do a whole lot to improve on the soft look of the details, but at least there's not a ton of slop. The lines are pretty clean, and most colors are consistent in tone and coverage.Some of it seems a tad thick, like the white on the skull of the Acromancer, and the eyes on Hercules are a tad...unusual. But overall the paint work is pretty average stuff, and fits with the general style. Because of the use of very hard plastic, there's not a lot of articulation here, and most of the joints are simple cuts. There's a cut neck, cut shoulders, cut waist, and ball hips The shoulders might look like balls, but don't get confused - they aren't. The hips are the best joints on the figure, with more mobility than I expected. I was able to get more poses out of these joints than I expected, but there are some key spots missing, like any sort of arm or leg cut. Just a few more joints would have resulted in an exponential increase in posability. There's a reasonable number of extras with each character. 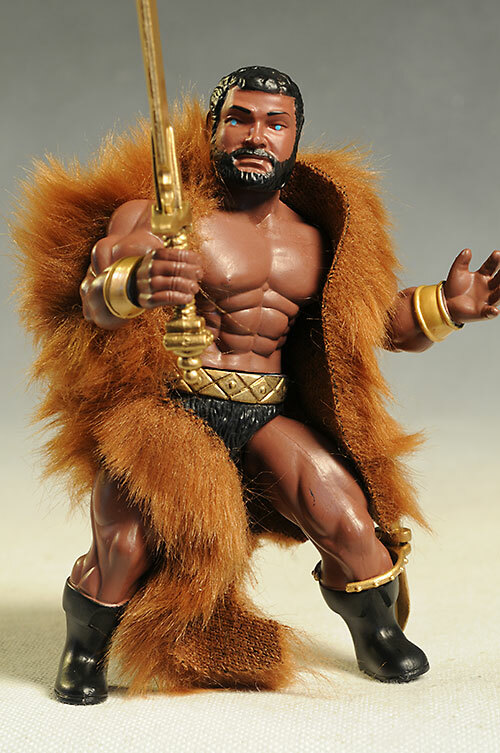 The Hercules has a small knife and removable leg sheath, along with a large gold sword. The weapons can be held in his right hand, and they look good considering the basic style. He also has the Sasquatch body wrap, which goes around both arms and one leg. I'm betting you can remove it if you want to badly enough, but clearly I didn't. The Archfiend I have includes a small shield, along with a small deadly dagger. The other Archfiend comes with a longer sword. Finally, the Acromancer has a cool silver helmet, along with a large silver ax. The paint and sculpt are pretty basic, but both work well. You might be able to remove the shoulder armor if you can pop of the head, but mine wasn't budging and I wasn't forcing. If the calendar said 1985, these would get four stars in this category. They've gone with the style and articulation of that time, making them a tad less impressive - at least in terms of play value - in 2013. Still, classic styles are classic for a reason. Kids could still enjoy these, but they're really designed for the kids that never grew up, and who yearn for the figures of their bygone years. The limbs are swappable, which of course adds to the fun for kids. I'm not sure a lot of collectors will use this feature, but the average kid loves building their own hero. Perhaps the greatest hurdle for any new line is start up costs. The small runs usually associated with initial offerings like this means costs are high, and therefore prices are too. To keep the line running, they have to convince collectors to pony up the bucks for the early figures. The price point on these is $23 each, very similar to the Masters of the Universe Classics. 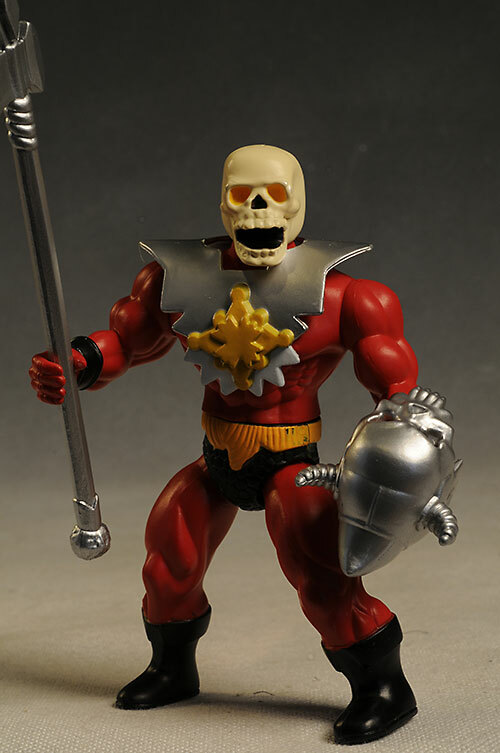 However, Zoloworld isn't Mattel, and the quality of the sculpt, paint, plastic and articulation is not the same. The plastic is really hard, and that might mean brittle. Be careful snapping the accessories into the hands, as you could conceivable break something. I didn't have that problem, but it's worth paying attention. That really hard plastic also makes it risky when swapping the limbs, especially the arms. Take your time popping them off - you don't want to break the shoulder post. 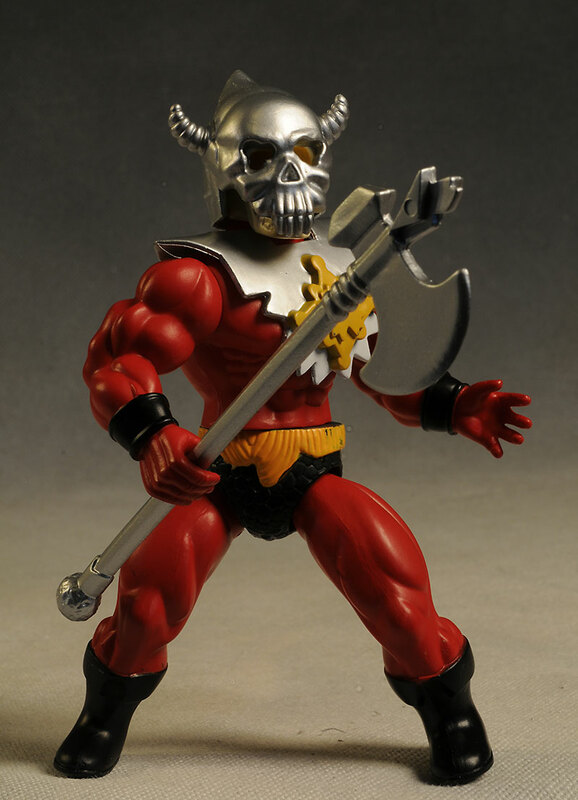 If you're one of those Masters of the Universe fans that hate the Classics update to the original look, then I bet you'll love these. 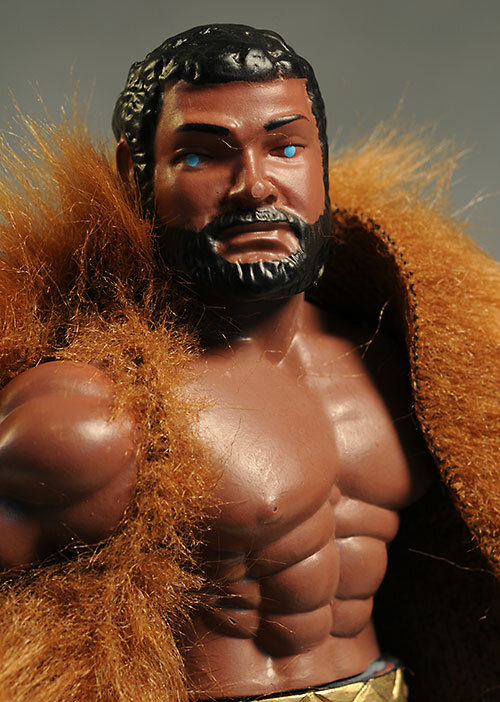 With a similar style but new characters, they could easily be added to your display of 80's figures. If you're not after that nostalgic look, then these probably won't be your thing. The sculpting is a tad soft, the hard plastic can give off a vibe that's more Asian knock off than mainstream figure, and they aren't going to fit in with more modern series. The real killer here is the cost - at $23, they're going to be a hard sell. The comparisons to similar lines are unavoidable, and I suspect buyers will feel they come up short. I know that much of this has to do with the (likely) very low production runs, but collectors aren't always willing to accept that situation. Zoloworld has some pretty ambitious plans for the line, and if they can get several waves out there, including some very large scale monsters, they may be able to hook in new fans with the style. The place to pick these up is Zoloworld's direct website. Expect to pay around $23 each for the singles. Not much from me, but you should check out Zoloworld's page for these figures.